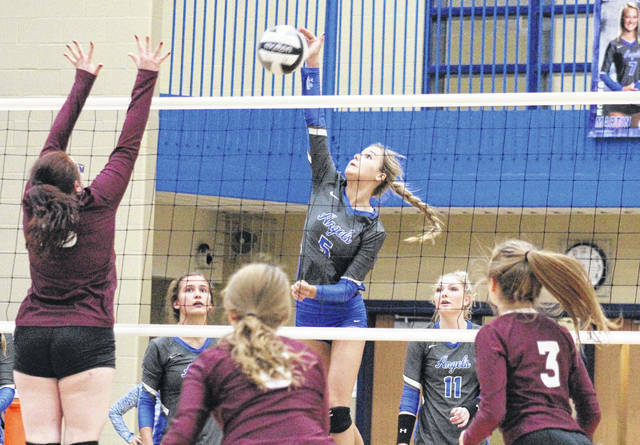 Gallia Academy sophomore Alex Barnes (5) attempts a spike in front of teammates Peri Martin (second from left), and Ashton Webb (11), during the Blue Angels’ victory over Vinton County on Oct. 18, 2017 in Centenary, Ohio. A total of a six people represented the Blue Angels on the the 2017 All-Ohio Valley Conference volleyball team, as voted on by the coaches within the eight-team league. Gallia Academy went unbeaten (14-0) in the conference for a second straight year, picking up its third OVC title in a row. Portsmouth was second in the league standings at 11-3. GAHS head coach Janice Rosier was named league Coach of the Year for the third consecutive season. Gallia Academy junior Ashton Webb was named to the All-OVC first team for a second straight campaign, after earning a honorable mention spot as a freshman. Joining Webb on the first team, are sophomores Alex Barnes and Peri Martin, both first time representatives. Gallia Academy’s honorable mention selection was senior Grace Martin, a West Virginia State University signee who was a first team All-OVC selection as a sophomore and a junior. GALLIA ACADEMY: Ashton Webb, Alex Barnes, Peri Martin. PORTSMOUTH: Aiden Fields, Allison Douthat. IRONTON: Lexi Wise, Mc’Kenzie Creemens. CHESAPEAKE: Natalee Hall, Karli Davis. FAIRLAND: Emily Chapman, Kelsie Warnock.